Luxurious touches add to a well-equipped and lightweight package. Trayon is a company with an established background in a market where few have been around longer than a decade. Having begun in 1994, it has seen the slide-on concept go from a novelty to a serious option for many thousands of campers. It has seen the spec sheets be redrawn from the concept of a simple box to drop on your ute to sophisticated outback accommodation that can and will take you everywhere. Trayon has seen it all. So when you get a Trayon product to review, you pay attention. The father and son team of Scholtz and Vernon van der Walt are passionate about the all-Australian concept. They also value the education process, in which all would-be slide-on buyers become equipped to make an informed choice, particularly given the lack of formal regulations for slide-on manufacturing in this country. The Trayon Dual Cab Deluxe retains the same basic layout as that of the company’s 1994 product. It is based on a light weight concept to limit or avoid the need for suspension changes. It locates the principal weight to the front of the unit and is designed to be a practical and comfortable home-away-from-home. And it delivers on all fronts. The Dual Cab Deluxe weighs 370kg empty and has 60 per cent of its weight in the front third of the unit. Fully loaded it would weigh around 600kg. It will fit any dual cab ute, while the single cab units are larger and weigh an additional 20kg. It can be attached or detached in six minutes single handedly using a cordless drill, and with the supplied stabilising cables and pegs provides a firm and comfortable free-standing residence that is completely self-contained with its own power, water and gas. You then have the freedom to use the vehicle for daytrips, etc. Access is via stairs moulded into the interior of the fold-down dust-seal door. The top folds over easily after attaching the fly, with gas struts taking the weight, in a set-up process that takes about three minutes. The Trayon is surprisingly well equipped for such a light package, with a 120Ah battery, mains 15A charger, solar kit and a battery management system coming. There are three 12V and three 240V outlets. The kitchen is a little basic, but has the necessities, such as a 100L Nova Kool marine grade fridge/freezer. There’s a 13L per minute pump for the sink or the external shower, which both feed from the 110L water tank and/or the Truma gas hot water system. Cooking is done on a Lido Junior two-burner and grill cooker that can be removed for use outside thanks to a stand that comes as standard. There is sleeping room for four: two on a 90mm HD foam double bed mattress on the fold-over unit top and two in single beds (one on the converted dinette and the other on the top of the kitchen bench). Converting the single beds would require clearing the kitchen, and eating or cooking externally would require additional tables for food preparation, as well as the transport of all items down the stairs from the interior. There is a heap of storage around the interior, plus several cubby holes and underbody drawers around the exterior. The whole unit can be easily secured with a locking security flyscreen door. At $33,500 you get a good, basic slide-on with a mix of luxury features and no-nonsense design. For many buyers, the great 10-year structural warranty and light weight would be the clincher. 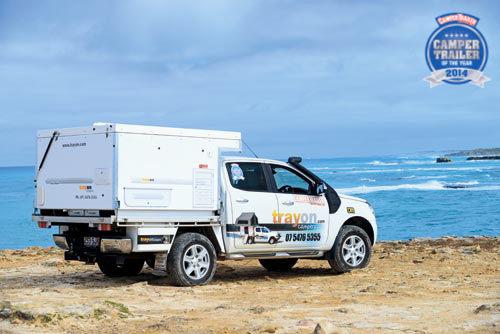 To discover the Trayon Dual Cab Deluxe’s final score be sure to check out Camper Trailer Australia magazine #72. Why not subscribe today! PHIL LORD: The Trayon has a comprehensive list of features, is good value and can accommodate four. It’s a great package. There is so much water, perishables provision and power with the Trayon, that you could certainly camp for a long time in the bush. But the lack of integrated external cooking facilities — so you can prepare, cook and wash-up outside — would be an issue for me. With a relatively light weight (370kg) and the heavy items installed in the front two-thirds of the slide-on’s length, the weight appears to be well distributed. to carry, set up and use. 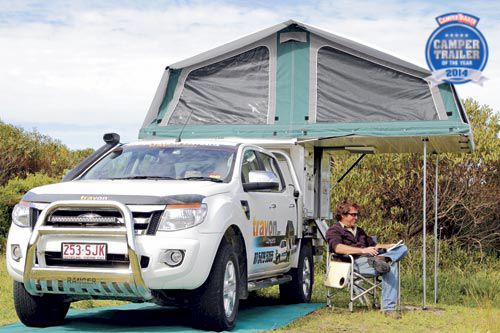 MIKE PAVEY: As a compact tray-top camper that sleeps four, it’s got generally good quality finishes. The body is secured to the tray using bolts, not ratchet straps. Good tare weight for this category at 370kg dry and 60 per cent of the weight contained in front of the rear axle. It’s a comfortable unit, thanks to the 100L fridge-freezer; internal two-seater dinette and double bed with comfort core high density mattress; gas hot water and rear shower; LED lights; security door and flywire. Set-up and pack-up is super easy thanks to the cantilever roof. Head height is limited at the rear of unit, but there’s reasonable storage. It should have a good resale based on the company’s long history, so it’s good value buying. JOHN WILLIS: I really, really like this camper. The weight is minimal, and correctly distributed to ensure the efficiency and safety of the vehicle, and it leaves enough room for a decent payload as well. It’s not a particularly innovative unit, given Trayon has been building them for over 10 years, but if it ain’t broke, why fix it? It’s a little pokey inside, so I’d be opting for the awning walls. This is exaggerated due to the lack of external kitchen. It’s a strong, sturdy and well-engineered product, that clearly demonstrates the experience and skill of its makers. That 10 year warranty speaks volumes. Specs are good, though it’s a little limited on power. Just needs a few extra creature comforts, but great for the money. I luff it!